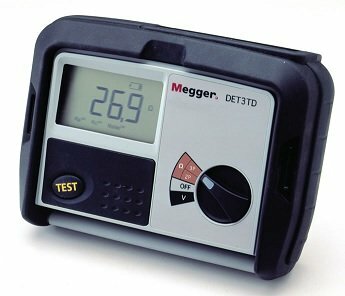 The new ground testing instrument family from Megger offers a unique solution to your ground rod testing needs. The complete kit of instrument, test leads, stakes and batteries are delivered in a tough polypropylene carry case - everything you need to start testing in one kit. In addition to this ease of use, the ground tester also allows you to check the connection and condition of the P and C spike, indicating the status on the instrument. The instrument also includes a voltmeter to allow you to measure the ground voltage. The ground tester can measure resistance from 0.01 ½ through to 2000 ½ and earth voltages up to 100 V. To allow testing in noisy environments the instrument is capable of rejecting noise of up to 40 V peak to peak. The Megger ground testers are designed to meet stringent safety standards and are rated CAT IV 100 V.